Without question one of the most colourful characters in Manx literary history, Trevor Ashe was responsible for one of the Island’s earliest collections of poetry, its first novel, and some of the most remarkably scurrilous behaviour ever seen on the Isle of Man. Born in Ireland in 1770, Ashe’s youthful career has been described as consisting of “seduction, duelling, debt and imprisonment.” He ended up in the Isle of Man in around 1790 where he found himself falling increasingly into debt. In response, Ashe thought he could make some money through writing a novel. The Manks Monastery, a love story concerning the seduction of a young nun, was published in 1792 and is considered to be the Isle of Man’s first novel. The book was sufficiently successful to allow him to pay off his debts and get off the Island. 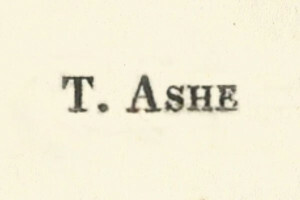 After a period working as a journalist and editor in the UK, Ashe returned to the Isle of Man in October 1824, when he became editor of the Manx Sun newspaper. However, he was replaced after only a month and he instead became a freelance journalist, author and editor. 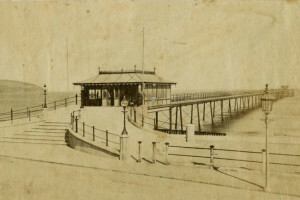 It was during this period that Ashe published one of the Island’s earliest books of poetry, The Pier and Bay of Douglas, in 1825. It was also in 1825 that Ashe founded the “Manx Museum” on the North Quay in Douglas. Predating today’s Museum by nearly 100 years, Ashe’s establishment offered a range of “natural and artificial curiosities.” The museum initially proved so popular that Ashe had soon moved and expanded it, but in little over three months the venture had failed completely. Ashe bitterly blamed this failure on the “party spirit” in the Island which made any cultured ventures inevitably doomed. The episode left Ashe bankrupt and imprisoned in Castle Rushen. Upon his release, Ashe returned to journalism in Douglas, where he sought to make additional income through writing slanderous articles to order. These activities then expanded into outright blackmail, even of some of the Island’s leading public figures. But his reputation soon deteriorated along with his prospects, and he eventually left the Island for the last time in May 1828. Although Trevor Ashe is not the most illustrious character in Manx history, there is no doubt that his life will continue to intrigue and interest anyone who comes to hear of it. His books too deserve to be known, if nothing else than for their important place in the early history of Manx literature.